Here is a selection of hand made games and books that I have created using a computer. The games are complete and all items will fit in the box. 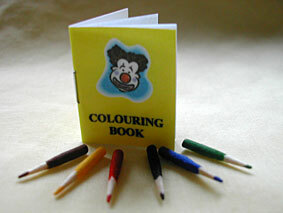 The colouring book (G001), has 8 drawings suitable for a child to colour in. The school exercise books (G005), all have 10 blank pages in them. Click on each thumbnail to see a larger picture. If you would like to place an order please click here for a printable order form. Just right for your children’s playroom or bedroom. The colouring book measures approx 2.5cm x 1.9cm and has 8 different pictures in it all ready to be coloured in. It comes complete with 6 little pencils. 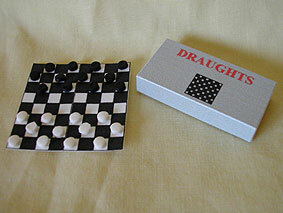 This Draughts Set is just right for your children’s bedroom or playroom. Maybe you have a toyshop to put it in or a pub. The board measures approx 3.1cm square and folds in half to fit in the box along with the playing pieces (I have included a few spare draughts in case some get lost). 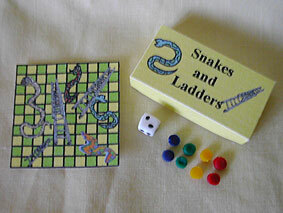 This game of Snakes and Ladders is just right for your children’s bedroom or playroom. The board measures approx 3.1cm square and folds in half to fit in the box along with the playing pieces and dice. 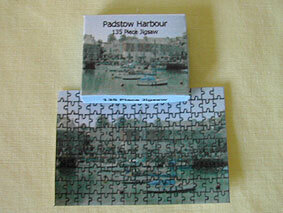 This jigsaw is a picture of Padstow Harbour, it measures approx 5cm x 3.1cm Please note it does not break up into pieces. The accompanying box has the picture on the lid. Lovely for your children’s playroom or maybe it could be laid out on the dining room table. Each of these 6 books has eight blank pages in it ready for your dolls to do their schoolwork. each measures approx 1.8cm x 2.2cm. 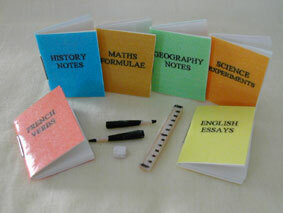 The covers are a different colour for each subject and the set also includes 2 pencils, a ruler and an eraser. This is a great item for your schoolroom or nursery. 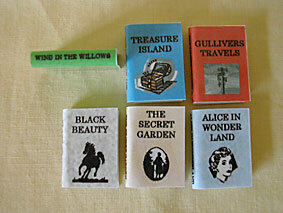 Here is a set of novels for your children’s room or bookshelf. Each one is different and measures approx 1.9cm x 1.25cm. The book title is printed on the spine so it will show when stored on a shelf. Please note these books do not open. Here is a set of reference books for your bookshelf or schoolroom. 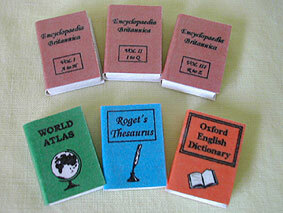 There are 3 Encyclopaedias, a Dictionary, a Thesaurus and an Atlas. Each book measures approx 2.2cm x 1.6cm and has the title on the spine so it will show when stored on a shelf. Please note these books do not open. 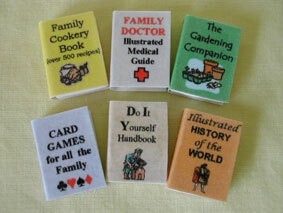 Here is a set of books for all the family to use, DIY and Gardening for Dad, Cookery and First Aid for Mum and Card games and History for the children. Each book measures approx 2.2cm x 1.6cm and has the title on the spine so it will show when stored on a shelf. Please note these books do not open. 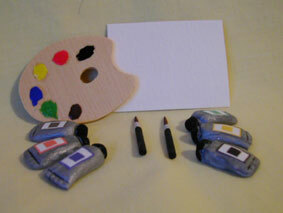 Is there a budding Artist in your dolls house because this could be the set for them. It consists of 6 tubes of paint, 2 brushes, an artist’s palette and a piece of artist’s canvas all ready for their masterpiece. Here is a set of Fairy Stories for your nursery or children’s room, just right for Mum and Dad to read before bedtime. 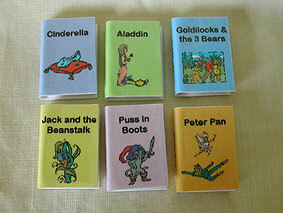 The titles are: Cinderella, Aladdin, Goldilocks and the 3 Bears, Jack and the Beanstalk, Puss in Boots and Peter Pan. Each book measures approx 1.9cm x 1.25cm and has the title on the spine so it will show when stored on a shelf. Please note these books do not open. Here is a set of early learning books for your nursery or children’s room, just right for Mum and Dad to read before bedtime. 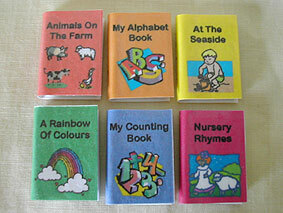 These include Alphabet and Counting Books, Nursery Rhymes and Colours, a book about the Seaside and a book of Farm Animals. Each book measures approx 1.9cm x 1.25cm and has the title on the spine so it will show when stored on a shelf. Please note these books do not open. This little book measures approx 2.5cm x 1.9cm and has 12 pages. Each letter of the alphabet is illustrated with a named picture. 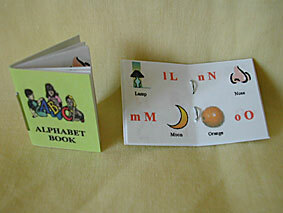 Just right for your Nursery or Schoolroom so the children can learn their alphabet. Please note you are only bidding for one book, there are two in the picture to show both the cover and the pages.